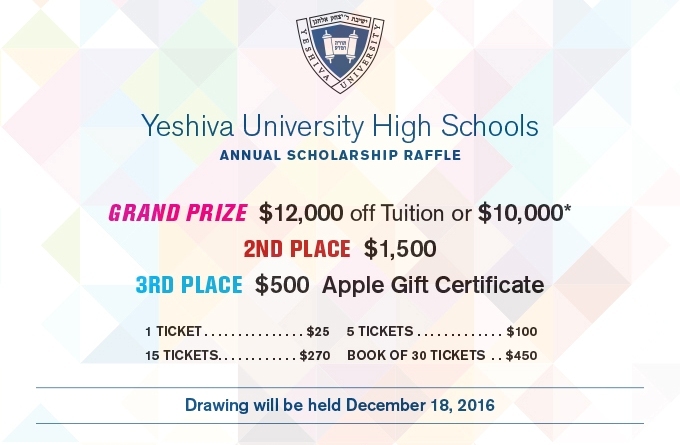 As a result of the outstanding response to last year’s campaign, we are pleased to announce the second annual YUHS Scholarship Raffle. This raffle will continue to enable alumni, friends and family of the YUHS community to help support our high schools while simultaneously becoming eligible to win great prizes. This Ticket signifies your participation in a charitable raffle and is non-refundable, non-transferable and has zero cash value. This raffle will be conducted on December 18th, 2016, with all necessary licenses, in accordance with the Laws of the State of New York. Tickets may be reserved, but not purchased, through this website. All proceeds, after costs, will go the benefit of the Yeshiva University High Schools. Raffle winnings are subject to applicable tax reporting and withholding rules. In accordance with IRS regulations, the purchase of a raffle ticket does not qualify for a charitable tax deduction.